. Designed to perform and allows these woofers sufficient space and depth they need to reach their full potential while not sacrificing comfort. Factors that you wont find in any other Custom Sub Packages. 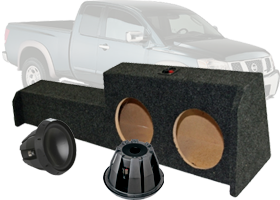 This section offers you the best Rockford Fosgate Nissan Custom Subwoofer Packages built and selected for your convenience. Check details on specifics to start creating those mini earthquakes!